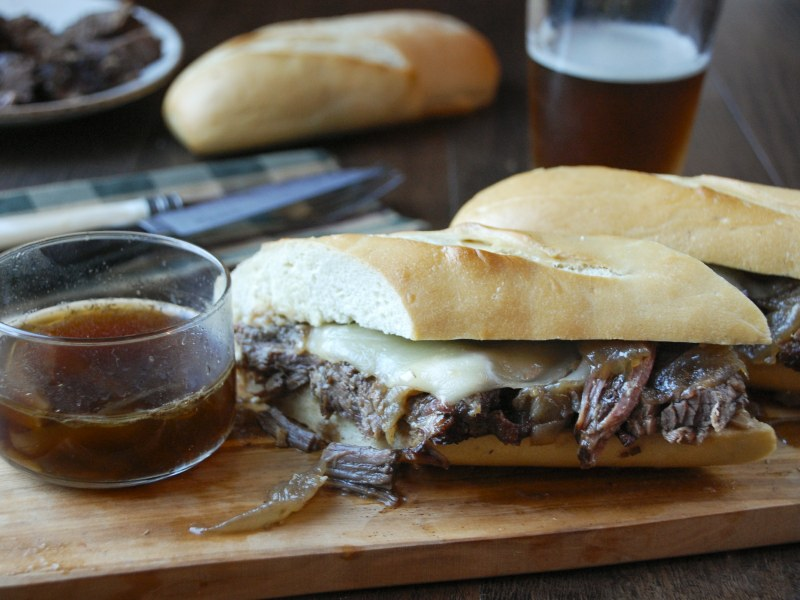 Turning a chuck roast into tender, delicious beef for French dip sandwiches no longer requires several hours. Use your countertop pressure cooker to get the job done quickly and easily, and with a lot less mess. 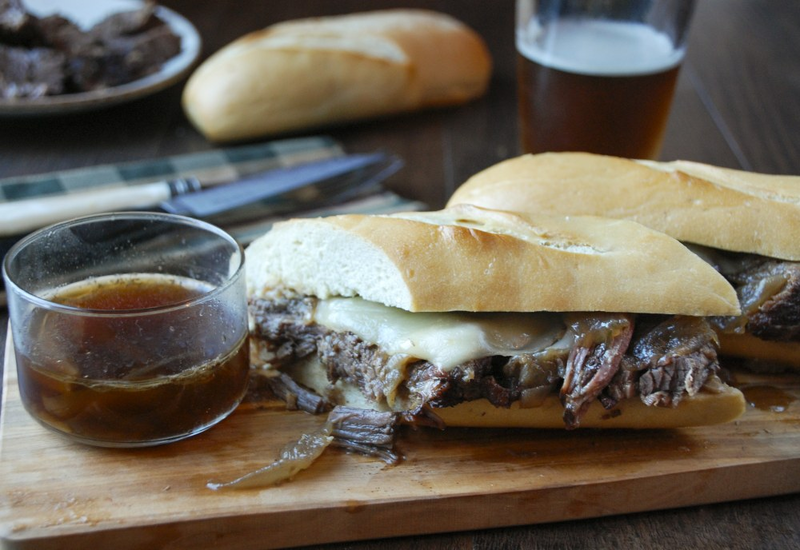 Despite the name, The French Dip sandwich is not actually French! However, the inventor, Philippe Mathieu was French. Philippe owned a deli and sandwich shop in Los Angeles where the sandwich was created by accident. Legend has it, Philippe was preparing a sliced beef sandwich for a policeman when he accidentally dropped the sliced French roll into the drippings of a roasting pan. The officer loved this sandwich so much, he came back the next day to request the sandwich dipped in delicious pan juices! Sweet onions lack the sulfuric punch of regular onions. Look for varieties such as Maui Sweets, Vidalia Sweets, Texas Sweet, and Walla Walla Sweets. Best part is, they won't make you cry when you cut them! Per Serving: 834 calories; 48g fat; 31.4g carbohydrates; 66g protein; 192mg cholesterol; 1151mg sodium. I left the onion out. I do not really love onion in sandwiches. Even though they are cooked, I just wasn't confident it would work for my palate. Without the onion, though, this is a delicious French dip. You have to have the right bread, but otherwise, this is a foolproof recipe. Went super-decadent and made fries, too. 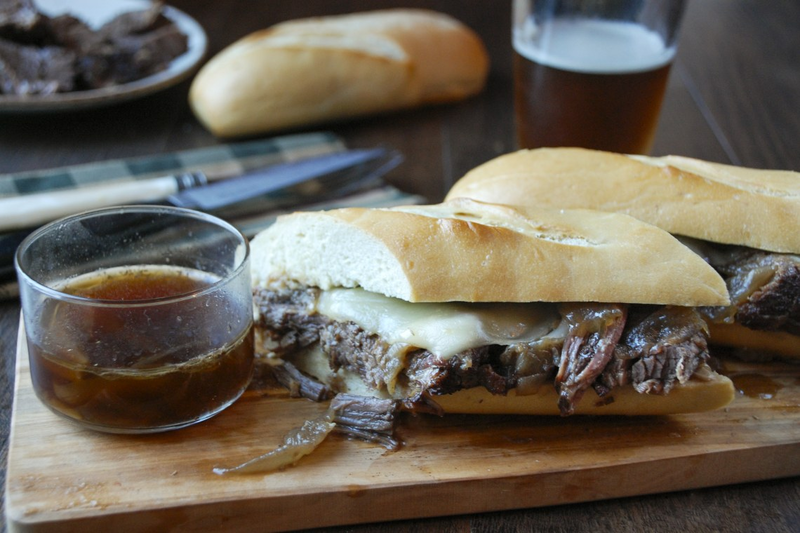 This is definitely one of the better french dip recipes I've tried! The beef is so tender, and the au jus is hearty and flavorful. I used one slice of provolone and one slice of Swiss cheese, and French bread for the sandwich. This recipe is perfect for the cold weather days ahead. Can't wait to try again soon! I really loved these french dip sandwiches. The meat was so easy to prepare in the pressure cooker, I think it took us around 30 or 40 minutes to make everything. We will definitely make these again. I thought the same. I am a nurse in SC. I love the machine, think some of recipes need a little adjusting here and there. This recipe was incredible. The only thing I changed was I omitted the ready cooked onions and just did another batch because I love sautéed onions. This was by far the very best French dip ever. We are a family of foodies and everyone wanted it the next night as well. I ordered a second pot for my 21 year old son in college, he swims and he and the guys in his apartment on the team love it! Used a homemade broth and vidalia onions. This was really good. Favorite recipe, reminds me of the French onion soup my mom always makes. I really enjoyed this recipe! Make sure to season the meat with salt and pepper. I would also use more thyme, for my own personal taste. Used the bottom round roast. Seasoned with more than just salt and pepper. Did the rest of the recipe as directed. Turned out Great! Timing seemed perfect. The sauce was delicious and the left over beef when cold has a great texture (not as chewy when roasted in the oven) and more roast beef taste. Any good artisan bread will do, just toast it. We did ours open faced. It's a keeper! Made this the other night and was flavorful and the au jus was fabulous. Had left overs that is just as flavorful and delightful each time I have tasted this. I am looking forward to each of my recipes that I am going to try. Amazing! Everyone loved it. Made it exactly how the recipe said to. The dipping juice was so good it could be a soup! For the wine I used a cheap $3 Cabernet Sauvignon and it was perfect! Meat was not as tender as I would have liked. Broth was a little greasy. That was a big hit!! Made it exactly to recipe! Texture perfect. Au jus outstanding! I took a chance and cooked my meat at 30 minutes per pound. Well, it put it over the top! My husband said this was “the meal of the month”! Good flavor but beef was not as tender - possibly use another cut next time. This recipe made a very good and quick dinner! This recipe is perfect. I switched some seasonings since I don’t like thyme. I cooked a 4 pound chuck so i increased the cooking time to 60 minutes. The meat literally melted in my mouth.